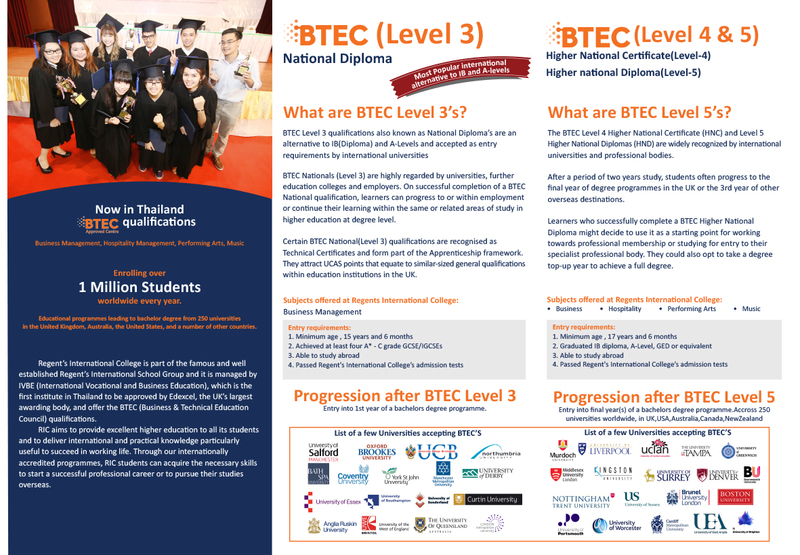 RIC is Bangkok’s only authorized BTEC institution which means we provide BTEC programmes right from our Bangkok campus. After a period of two years study at RIC, students progress to the final year of bachelor degree programmes in the UK or other overseas destinations. Chosen by over 1 million learners every year and is the UK’s largest education body, BTEC offers a range of professional qualifications for anyone taking their first steps into the world of work, progressing through their careers, or planning to enter university. After 30 years of proven success, more and more employers and Higher Education institutions across the globe are choosing BTEC-qualified candidates for their practical knowledge and employability skills. *In absence of an official IELTS score, Regent’s provides its own English language testing. Entry will be dependent on acceptance onto the course by the Regent’s enrollment committee. RIC (Regents International College) 2018. All rights reserved.